This is a place that I’ve been wanting to check out for quite a while, but as they say, a baby changes everything. We take L out to eat at a lot of places, but we’re always a little hesitant at bars unless we see a kids menu posted online or it’s someplace we’ve been before and know it’s kid friendly. 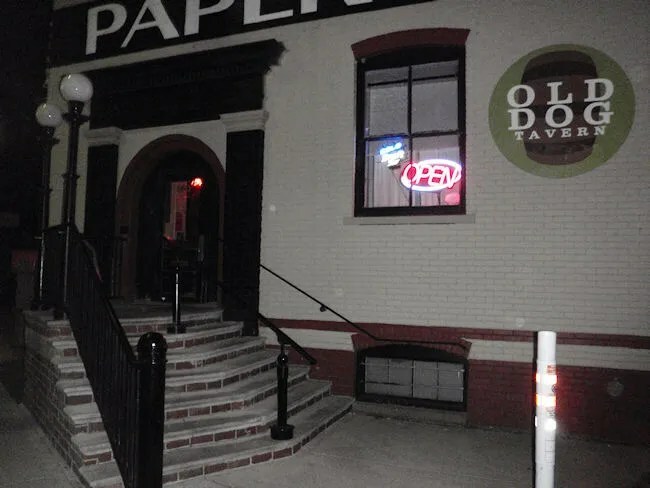 We actually tried to stop at Old Dog Tavern one time just before L was born for lunch, but we walked in on a day when they were shooting a movie in the space. We walked past a bunch of production people to the bar area, but it was deserted and we couldn’t tell if they were actually open for lunch or not, so we bailed and went to the Central City Taphouse instead. So, Old Dog got put on the back burner. It’s more of a bar than a restaurant so we didn’t feel it was an appropriate place to take a baby. When my Mother-In-Law comes to town, we have kind of started this thing where she and I go out for a beer after J and L go to bed. She came for the weekend because I had to work all three days but ended up staying a couple extra to do some things with J while I stayed home with the baby. After J and L went to bed last night, MIL and I decided to go have a beer. Last time we did this, we went to Paw Paw Brewing. MIL asked if there were any other breweries in the area that we haven’t been to, but I didn’t want to leave Kalamazoo. 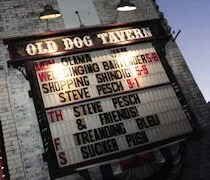 I thought about Bell’s, but then I suggested Old Dog Tavern where we could enjoy both a wide variety of Michigan brews and some yummy looking food. The large bar area has awesome hardwood floors, distressed, exposed wood beams, and a huge bar. There are at least two large rooms in addition to the large beer garden which just opened. MIL and I took a table near the back of the space which also sits near a stage for the variety of live music that they have almost every night. The bottle beer list was already on the table, but the draft was not. I got up and walked to the bar to find the draft list on a couple of chalkboards behind the bar. We were also missing a food menu, but I found one on another table that wasn’t being used so I reached over and grabbed in. I was really worried for a few minutes that we were going to have to walk out and go across the street to Bell’s. We couldn’t get a waiter to come to our table and I couldn’t find anyone behind the bar to take an order. We stuck it out longer than we probably should have, but eventually, the wait paid off. The lone waiter brought a round of drinks to the table next to us and finally saw us sitting there. I started with an Old Dog Tavern IPA. I honestly don’t remember what MIL ordered. 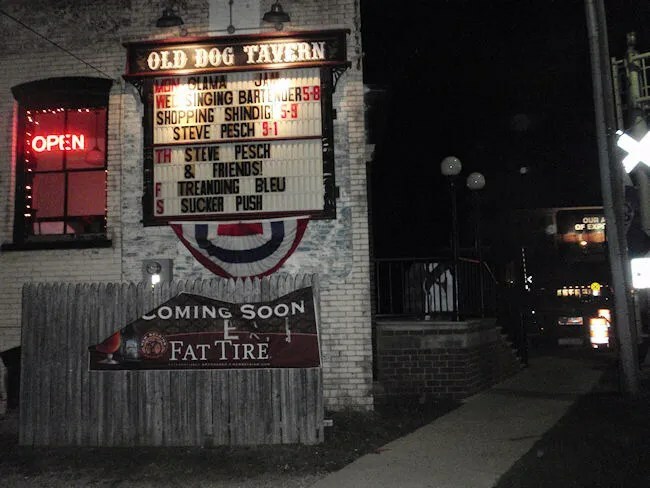 The Old Dog Tavern IPA is brewed exclusively for Old Dog Tavern by Mt. Pleasant Brewing Company. It’s a pretty solid IPA with a very hoppy taste. Since we had the waiter there, we asked to put a food order in before he ran away. Almost everything on the menu looks delicious, but I had to go with “The Husky” burger. 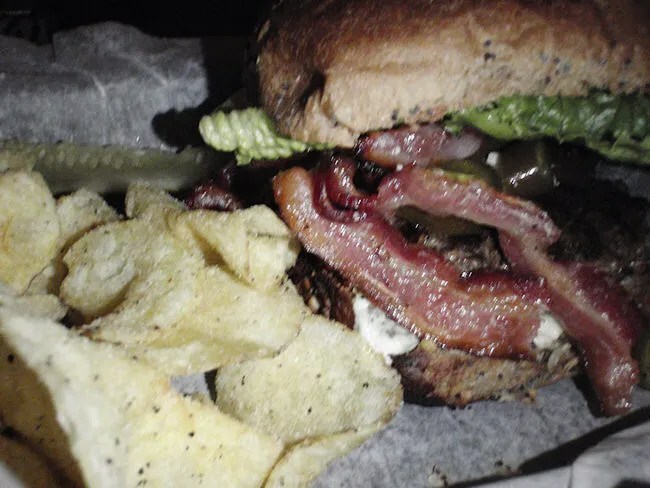 This very tasty burger comes with bacon, bleu cheese, Jalapenos, caramelized onions, and a garlic aioli on a whole wheat bun from Mackenzie’s Bakery. The juicy, house made patty was perfectly cooked and the Jalapeno’s really stood out as the dominate flavor after I asked to leave the aoili and onions off. In addition to the Jalapeno’s, there was a large pile of both crispy bacon and bleu cheese. The sandwich came with salt and pepper chips and a pickle slice. 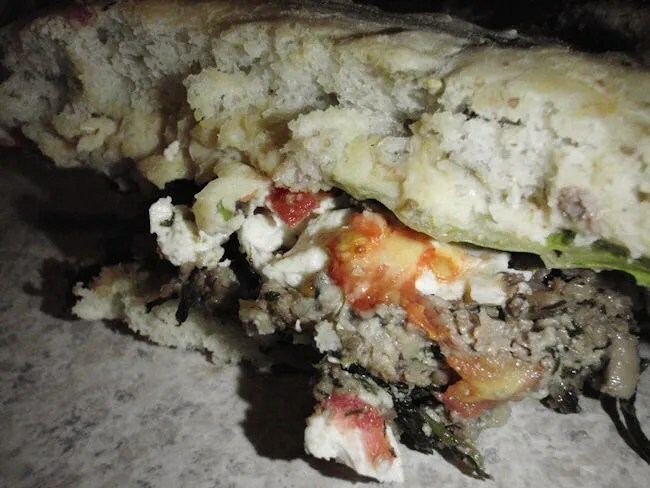 My Mother-In-Law ordered the Tofu-Nut-Spinach-Oat Burger. This beefless burger is made with cashews, walnuts, sauteed onions, spinach, celery, and a mixed herb and spice blend. It’s then pan-fried and topped with banana peppers, tomato, feta, lettuce, bell peppers, and hummus. It’s served on a rosemary foccacia bread and served with chips and a pickle spear. She took one bite, looked at me and said “This is really very good.” At first, I thought she said it wasn’t very good, so I asked again…she said it was very, very good. She said the word “tofu” is usually a turn off for her, but this burger may have completely changed her perspective on the foodstuff. About halfway through our sandwiches, J’s mom had to flag down the waiter so we could get a second beer. 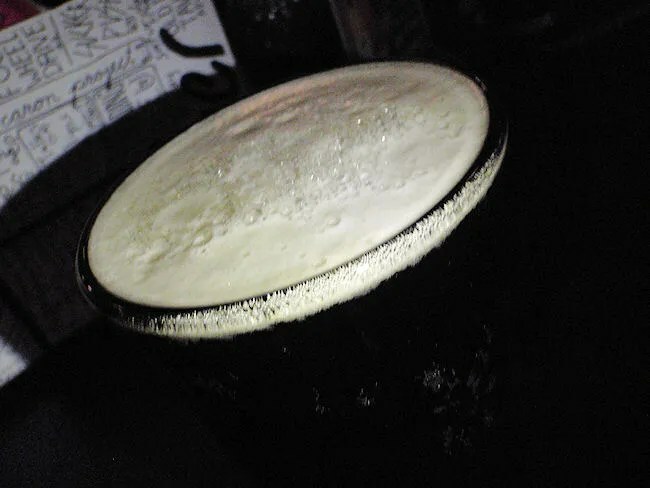 This time, we both went with the Crazy Train Black IPA from Mt. Pleasant Brewing. I am a really big fan of this one. 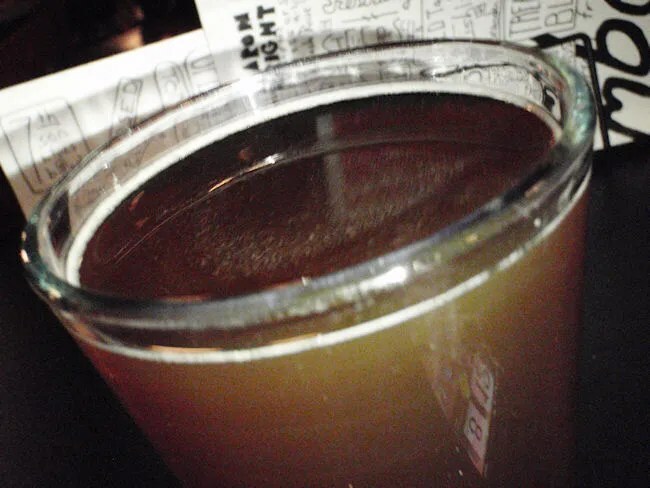 It had a rich malty, roasted flavor that went down very easily. When the waiter came to pick up our plates, he let us know he had our check if we were ready. I asked MIL if she wanted another one and we both decided that probably wasn’t a good idea. The tab for the two sandwiches and four beers was exactly $30. They only take cash at Old Dog so both MIL and I pulled out $20’s to cover the check. I told the waiter to keep half of the change and then we were on our way. Old Dog Tavern is a pretty amazing space with a good beer list and great food. The only downside to our night out was the service and it was almost enough to ruin the evening. I’m glad we stuck around because the food is definitely worth it and we were able to try out a few beers neither of us have had before.